Here's a short video that explains TPS in simple terms. At two minutes, this video only scratches the surface of the Toyota Production System by focusing on the two pillars, Just-in-Time and Jidoka. 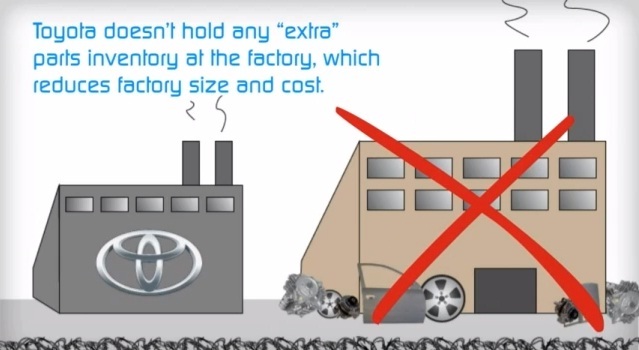 Just-in-Time - Toyota is more efficient by not keeping any excess inventory on hand. Jidoka - At Toyota, anyone can stop the line for a quality problem. Obviously, JIT and jidoka are considerably more than simply reduced inventory and andon cords, just like TPS is so much more than JIT and jidoka. But for people who think TPS is something you use to clean your walls before painting, this brief introduction can lead to a broader discussion. Perhaps you could use it to open a lean training session. Just look at that itty bitty Toyota factory! What first caught my attention is the use of unique graphics and a nice clean font. I think it's a brilliant example of how to do a proper presentation. Each slide has a minimum amount of information and the illustrations are professional grade, yet still whimsical. Well done! "make and deliver vehicles in the quickest and most efficient way possible." Now I know we're dealing with the basics here, but this bugs me a little bit. Efficiency is key in TPS, but quicker is not always the answer. "Takt time" is a critical aspect of the Toyota Production System. Sometimes we'll need to slow down to meet customer demand! We can do this more efficiently by working with less people, or perhaps doing multiple parts. Apart from that minor pet peeve, I do like the video. Simple and to the point. The final few sentences emphasize the long-term thinking of TPS, continuous improvement and the importance of the employees. So it's not all just-in-time and jidoka! Looking for more lean videos? Click here to check out the entire collection!